The colourful Sort N Shake wooden block set will make a big noise in little hands. The ten Sort N Shake blocks will fascinate childrens eyes and ears as each block makes an intriguing noise when shaken! Little ones will be delighted to discover which block rattles, rustles, jingles or clatters.Appealingly crafted in solid wood, each colourful block is uniquely sized and features a different friendly animal design. Little explorers will adore lining up the blocks to compare the size of the tiny, scuttling spider against the cheeky monkey, all the way up to the lofty giraffe. Each block also shows individual numbers, the corresponding amount in types of food, and the animals bottoms to match up  perfect to help early learners count, stack and sort in size. 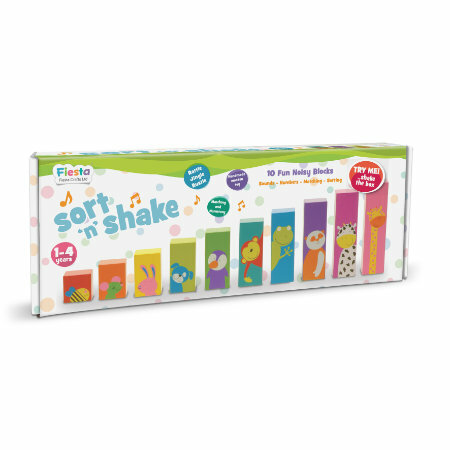 As with all Fiesta Crafts pre-school toys, Sort N Shake has been thoughtfully designed to encourage learning through play. Supplied in a vibrant colourful box which can also be used for storage.